In addition to some unwanted pests in the Kahului Airport area, there are also many species of rare and beautiful native insects known from that part of Maui. One of these insects (found in nearby Makawao) is the native koa bug also known as the stinkless stink bug. Unlike its mainland pest cousin - the true stink bug, these koa bugs lack the glands that allow real stink bugs to live up to their name. 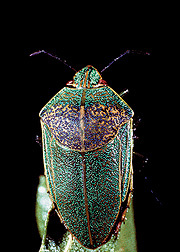 The koa bugs, which have bodies that reflect almost all the colors of the rainbow, are only found in Hawai`i and are commonly found on bushes of a`ali`i as well as koa trees (which is how they got their common name). Unfortunately, a fly that was introduced to help get rid of the pest stink bugs (which have been causing problems with some of Hawaiis agricultural crops) does not know the difference between the bad bug and the good koa bug. By going after the wrong guy it has had a impact on the reduction of its populations on most islands.